Shade-O-Matic Woven Wood Shades brings the beauty of nature into your home with custom made Woven Treasures Woven Wood Blinds by Shade-O-Matic. Woven Treasures combine the traditional, classic look of a woven wood shade with styles and patterns designed to impress today’s fashion conscious buyers. Our exciting natural woods and yarns are woven together to achieve a natural handcrafted shade. Choose from open weaves that gently filter the light or tight weaves for maximum privacy. Bring a little bit of the outdoors into your home! 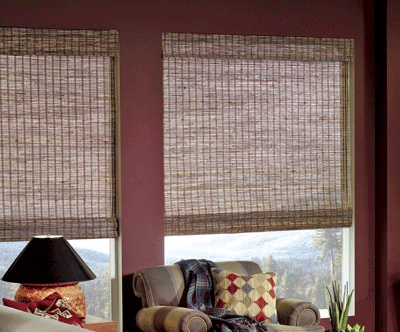 Learn more about Woven Wood Shades.